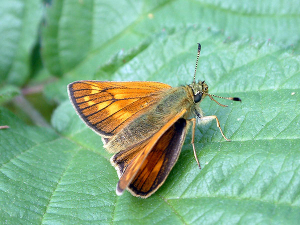 Observation - Large Skipper Butterfly in Tamworth - UK and Ireland. Description: Single specimen spotted near Borrowpit Lake, probably a female from the pattern on the wings (lacks a dark band). Single specimen spotted near Borrowpit Lake, probably a female from the pattern on the wings (lacks a dark band).